In a Nutshell: When Overland Park, Kansas, was founded, the goal was to make it an attractive place to live and work. Nearly 60 years later, the plan’s effectiveness can be seen in the city’s low unemployment, high median income, and various thriving industries. One key to this success is a robust transit infrastructure, allowing residents to travel easily between work and home. Another aspect of Overland Park’s success is its lively culture of sports, arts, natural parks, and museums. Equally important is the mutual commitment by the city and its businesses to ensure young people are receiving the education that will help them succeed when they reach the job market. As Overland Park continues to grow, it is dedicated to striking a balance between its founding vision and the changing demands of this rising generation of workers. What makes a city an attractive place to live and work? When Overland Park, Kansas, was officially founded in 1960, its city planners had a few good ideas. Of the factors contributing to quality of life, financial well-being is a major one. Overland Park’s Chamber of Commerce reports the city’s median household income is over $71,000. The city also enjoys a AAA bond rating from Fitch, Moody’s, and Standard and Poor’s, making it one of only 40 cities to earn this rating from all three agencies. This means the city enjoys lower interest rates on bond issues, which in turn reduces the fiscal burden imposed on taxpayers. Overland Park’s unemployment rate is also low. “We have a 2.5% unemployment rate, but that’s a good and a bad thing,” Johnson said. “It’s kind of a double-edged sword.” A strong local economy helps keep the city’s standard of living high, of course, but it also creates challenges for the economy and companies looking to expand. As a result, Overland Park is shifting the focus of its economic development efforts. In addition to recruiting business, the city is now working to attract more people to develop its labor force. This makes Overland Park an especially good city for improved job prospects — and, once you get there, you’ll likely want to stay. That’s why Overland Park has been named one of our Top Cities for Finding Work. Overland Park’s dedication to community has made it home to a variety of industries. These include information and communication, professional and technical services, and financial and insurance services, among others. “We have a lot of technology and communications companies,” Johnson said. She credits Overland Park’s telecommunications infrastructure as the reason for their presence. Not least among them is Sprint, which has its world headquarters in the city. “That’s our major employer in the community,” Johnson said. Other companies in the industry with local presences in the area include CenturyLink, AT&T, and Verizon. Overland Park, and the larger Kansas City metropolitan area, also host a variety of engineering and architectural firms. Among them are Black & Veatch, Burns and McDonnell, Populous, and Henderson Engineers. “The KC region is in the Top 5 for largest concentrations of architecture and engineering employment in the U.S,” Johnson said. In the realm of finance and insurance, Overland Park is home to Waddell and Reed, Inc. (a subsidiary of Waddell and Reed Financial Services), as well as Empower Retirement (formerly JP Morgan Retirement Plan Services). H&R Block has a presence in the greater metro area. PNC’s Midland Loan Services is also headquartered in Overland Park. Swiss Re, a reinsurance company, has offices in the city, as does Travelers Insurance. Overland Park is home to many businesses, including the headquarters for Sprint Corporation. Other major industries in Overland Park include healthcare and social assistance. The multitude of retail parks, which comprise over 60 million square feet of space, also make this a major economic sector. The city also hosts various other professional, scientific, and technical services. Not a community to rest on its laurels, Overland Park is at work improving its public transportation system. Johnson said the city is eager to get a jump on meeting the needs of its projected population growth, ensuring the thoroughfares remain open and easy to navigate. But she added that the city is equally dedicated to easing the environmental strain that arises with a larger population. While Overland Park strives to make worker commutes as painless as possible, the city’s roadways don’t just lead to the office. A variety of leisure destinations make Overland Park an attractive place to live as well as work. So the city’s shorter commutes mean more time to enjoy these recreational resources. Whether you favor sport, art, or nature, Overland Park offers pastimes that create a rich quality of life for residents. Obviously, this keeps residents happy, and a happy population, in turn, attracts businesses to the community. After all, high quality of life is a major selling point for businesses. The KC metro has enjoyed recent success in the professional sporting arena, including the Kansas City Royals’ World Series win in 2015. “The Chiefs have also done well the last couple of years,” Johnson said. Sporting Kansas City also won its fourth US Open Cup in 2017. This athletic success “brings good vibes to the community, on the sports side, as well as something to rally around,” Johnson said. And Overland Park ensures athletics is more than just a spectator sport. The city operates 83 parks that feature hiking trails, sports fields and facilities, fitness complexes, swimming pools, and public golf courses. There are also recreational complexes and programs operated by the Blue Valley Recreation Commission and the Johnson County Park and Recreation District. To complement its success in professional soccer, the city is home to the Scheels Overland Park Soccer Complex. This sprawling, 96-acre facility features 12 lighted, regulation-size soccer pitches. These include synthetic turf and temperature-controlled fields to keep players safe and comfortable. With these kinds of amenities, it’s no surprise that the complex hosts local, regional, and national soccer tournaments. Beyond sports, Kansas City has a thriving cultural atmosphere. A centerpiece of this is the Kauffman Center for the Performing Arts. This facility is dedicated to providing access to the arts for Overland Park residents, with a special emphasis on enabling children and underserved communities to engage with music, dance, theater, stand-up comedy, and other types of performance. Visitors and residents with a taste for nature and history can enjoy the Deanna Rose Children’s Farmstead, a historical recreation of life on a frontier farm. The complex features more than 250 birds and animals, as well as various educational and recreational activities. Overland Park also maintains an arboretum and botanical gardens with 300 acres of gardens and hiking trails. 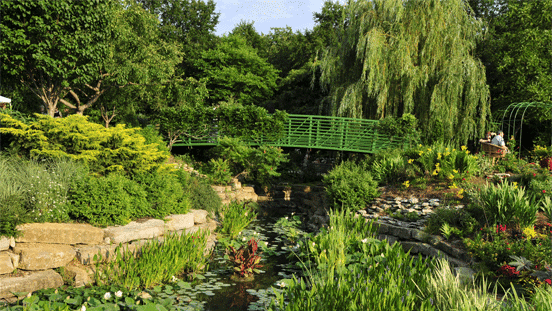 Overland Park’s Arboretum and Botanical Gardens features hundreds of acres of beautiful green space. If you prefer air conditioning to the great outdoors, Overland Park is home to prominent museums. The Museum at Prairiefire specializes in natural and scientific history, and it partners with other institutions nationwide, including the American Museum of Natural History, to bring exhibits to Overland Park. At Johnson County Community College, residents will find the Nerman Museum of Contemporary Art, home to the four-state area’s largest collection of contemporary painting, sculpture, ceramics, and photography. Clearly, Overland Park is home to a diverse assortment of pastimes and pursuits. These create a strong cultural foundation for the community, keeping quality of life high. And in that same vein, it fosters an intellectual atmosphere that complements Overland Park’s emphasis on education as a contributor to economic growth. Johnson credits Overland Park’s educational success to the partnership between city officials, local employers, and educational organizations. Together, they are committed to preparing students for success in the workforce. According to the school-ranking platform Niche, Overland Park scored 11th among Cities with the Best Public Schools in America in 2018. All three of Overland Park’s school districts — Blue Valley, Olathe, and Shawnee Mission — ranked in the top 10 of the Best School Districts in the Kansas City Area. Overland Park also took the top three spots in the Best School Districts in Kansas. Overland Park’s pursuit of excellence isn’t limited to public education. The city is home to Cleveland University-Kansas City, one of the nation’s oldest nonprofit chiropractic colleges, and also to Johnson County Community College, which Niche ranks as fifth in Kansas (out of 24 community colleges) and 72nd in the United States (out of 851). The results of Overland Park’s commitment to education are clear in its low unemployment and high median income. “Our job market is successful, in part, because we have a great education system,” Johnson said. As Overland Park continues to grow, the city is working to align its founding vision with its current economic goals and the desires of the workforce and residents. To that end, the city is developing Downtown Overland Park. The city’s downtown currently consists of small retail operations and some housing. The Downtown Overland Park development will introduce new apartment complexes and a 120,000-square-foot office space, with the possibility of adding another such facility in the future. “We can really transform that area into a true live-work-play environment,” Johnson said. Such preparation is geared strongly toward the growing number of millennials in the labor market and their expectations of work-life balance. “You’ve got to have locations where they can walk to get a cup of coffee or get a beer at the end of the day or find that third office space,” Johnson said. Thus, Overland Park is working to develop several areas into appealing, mixed-use developments. Obviously, this is good news for young workers in Overland Park — and, in keeping with the city’s philosophy, what’s good for residents is good for business, and vice versa.